Submitted photo The Galion Tigers were well represented by Braxton Tate at the state cross country meet on Saturday, November 10 at National Trail Raceway in Hebron. Tate finished in ninth overall in the field to run his way to All-Ohio honors. HEBRON — After the 90th annual boys and 41st annual girls State Cross Country Meet at National Trail Raceway was pushed back a week due to flooding, schools and athletes from all over Ohio gathered in Hebron with championship hopes in on a frigid cold Saturday. Among those in competition were the Northmor Lady Golden Knights in the Division III portion of the race and the Galion Tigers’ lone representative, Braxton Tate, in the Division II race on the day. In that Division II race, Tate was making his second consecutive appearance after qualifying last season as a sophomore. Tate would not see the result that he was looking for in 2017, running his race in 16:55.8 which placed him 57th overall in the field. However, 2018 proved to be a much more positive finish for the young Tate as he crossed the finish line in a time of 16:33.7 which cracked the top-10 and placed him ninth overall in the field of 178 runners from across Ohio. Kyle Johnston of Lexington would win the boys DII race with a time of 15:52.9 after finishing fourth last season while the team from Woodridge claimed the team title after finishing fourth a season ago. Other boys individual and team results from Saturday in Hebron were: Division III: Individual winner- Noah Fisher from Ayersville in 16:14.4 (14th in 2017); Team winner- Fort Loramie (7th in 2017); Division I: Individual winner- Conant Smith of Middletown in 15:43.4 (2nd in 2017); Team winner- Hudson (2017 champion). Over in the girls DIII race, Miranda Stanhope of Badger would shock Emma Watcke of Minster to claim the state title, finishing her race in 18:51.6. Stanhope finished 16th a season ago while Watcke was attempting to repeat as state champion. Minster would win the team championship on the day, which proves to be a recurring theme as they claimed their third championship in four seasons (runner-up in 2015). As for the Lady Golden Knights, Kristie Wright turned in the top finish on the day, crossing the finish line in 21:55.7 and claiming 108th. Julia Kanagy finished 134th in 22:34.1 and Olivia Goodson ran her race in 22:39.9 to take 139th. Sabrina Kelley finished 145th in 22:54.7 while Julianna DiTullio was 150th with a time of 23:06.6. Bailey Snyder ran a time of 25:07.5 to take 174th while Carolyn McGaulley finished in 178th with a race time of 25:24.6. Other girls individual and team results from Saturday in Hebron were: Division II: Individual winner- Ella Gilson of Hawken in 18:37.4 (15th in 2017); Team winner- Lexington (2017 champions); Division I: Individual winner- Taylor Ewert from Beavercreek in a time of 17:38.7 (3rd in 2017); Team winner- Beavercreek (5th last season). Some additional, notable finishes and facts from the state meet: Shelby finished third overall in the boys DII race after being seeded as the top team in the state for much of the season. The Whippets tallied 132 points, 23 points behind the winners from Woodridge. The Lex boys finished seventh as a team in the boys DII race after winning the title a season ago. The Minutemen also claimed the team crown in 2015 before finishing fourth as a squad in 2016. As for Lady Lex, they claimed back-to-back championship rites and have won the team state title three times in the last four seasons (also won in 2015, runner-ups in 2016). Watcke, a junior, was the only returning state champion from a season ago. On the boys side, it was a trio of talented seniors earning titles in the likes of Dustin Horter (Lakota East, DI), Zach Kreft (Buckeye Valley, DII) and Chad Johnson (Colonel Crawford, DIII). All three of those young men now run for Division I NCAA programs as Horter attends Indiana, Kreft goes to Notre Dame and Johnson is at Iowa State. Similar to the boys, the 2017 champions in the girls DI and DII races have since graduated and moved on to Division I NCAA careers. Morgan Gigandet of Troy won the DI race in 2017 and now runs with Johnson at Iowa State while the DII champion, Annie Zimmer from Chagrin Falls, chose to continue her academic and athletic career at Penn. 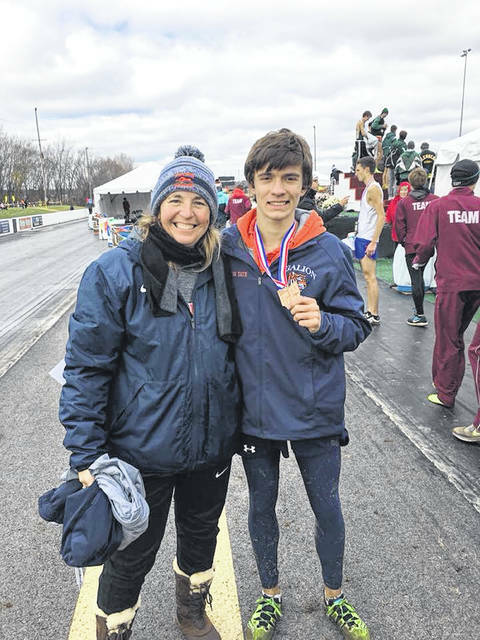 https://www.galioninquirer.com/wp-content/uploads/sites/38/2018/11/web1_Braxton-and-Coach-Conner.jpgSubmitted photo The Galion Tigers were well represented by Braxton Tate at the state cross country meet on Saturday, November 10 at National Trail Raceway in Hebron. Tate finished in ninth overall in the field to run his way to All-Ohio honors.